There are several symbols and safety marks that you might find on a toy, and each one is important for different reasons. The symbols indicate that the toy you’ve bought complies with all the necessary safety standards. Toy safety standards in Europe are amongst the highest in the world, so you can be sure that all possible precautions will have been taken to make sure that toy will be safe for your child to play with. What is the European Toy Safety Standard? European Toy Safety Standard EN71 is a set of specific toy safety legislation which applies to all toys for children up to the age of 14. In addition to general safety, the standard also splits toy suitability into age groups, and ensures that there are warnings on any toys that are considered to be unsuitable for children under the age of 36 months. The legislation covers aspects of manufacture such as flammability, toxicity and safety marking. The most common toy label you will see is the CE mark. This symbol, which should appear somewhere on a toy along with the name and address of the first supplier, has been required by law to be displayed on all toys that have been on the market in the EU since January 1990. It’s not a consumer mark, but is there as proof to the authorities that the toy is intended for sale in the European Community and a declaration by the manufacturer that it meets all toy safety requirements. The CE logo does prove that the toy has been tested for compliance with these standards, though. This logo shows that in the opinion of the manufacturer, a toy isn’t suitable for children under the age of 36 months. 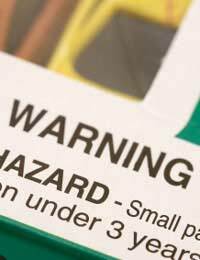 It’s becoming more widely used, and is mainly displayed on toys which might not pass the choke hazard test, and have small parts which younger children could remove and swallow. A test cylinder has been designed to replicate a three year olds gullet, and any Items that do not fit into the test cylinder pass the test. Because of this test, there has been a reduction in cases of children choking on small objects. The test isn’t carried out on toys for children of three years and above. You’ll often find this safety mark on toys where you would expect adults to be involved with play – water toys for example. It means that although the toy still meets all the required toy safety standards, it still shouldn’t be used without adult supervision, because children being children, they could misuse it and cause injury to themselves or others. The Lion Mark was developed in 1988 by the British Toy and Hobby Association to act as a recognisable safety mark which not only indicates safety, but also quality. To be entitled to display a Lion Mark symbol, a BTHA member has to sign a licence agreement setting out the terms of its use, and indicates that the member sticks to the BTHA Code of Practice which also covers toy advertising and counterfeiting. The Lion Mark is a genuine consumer symbol, meaning that if you buy a toy with this toy label, you can be sure it will be safe. In 1991, the Toy Retailers Association (TRA) joined forces with the BTHA and launched the Approved Lion Mark Retailer Scheme. Toy shops and other members of the TRA have to abide by a strict Code of Practice stipulating that they only sell products which conform to the European Toy Safety Standard EN 71. So, some safety symbols mean more to you as a consumer than others, but they are all there to provide guidance and some level of reassurance that the toys you are buying are safe and suitable for your child. We can't comment on individual cases like this. You would need to check the safety standards yourself. These can be ordered in at your local library. I have a product that needs to be sent for testing. Who do I send it to and where?